With my second trip to Japan looming ever nearer, I’m still working my way through Rosetta Stone to learn Japanese. I’m at an odd point in my progress: both full of wonder at how much I’ve learned and distressed at how little I’ve learned. I’m sure many fellow language learners can identify! Side by side with my language learning, I’m continuing to read and learn more about Japanese history and culture, and enthusiastically planning the itinerary for our upcoming visit. Today, I’d like to share with you four Temples Not To Miss in Kyoto. Yasaka Shrine is another of the best known in the city. Indeed it is said that Gion’s prominence as a geisha entertainment district grew from humble beginnings servicing travellers to this Shinto shrine. It enjoys a pretty location in Maruyama Park, right in the heart of the district. Yasuka is a great place to get involved in religious activities such as purchasing o-mikuji (fortunes). Shake one of the fortune boxes provided (choosing between general fortunes and those concerning your love life). When a numbered stick falls out, take it to the counter and make a small payment to receive the associated fortune slip. If it promises good fortune, you may choose to take it with you. However, if it’s a curse, there is a way out. You can ask the resident deities or spirits to negate the curse by tying the paper slip to one of the ropes provided. Likewise, you might like to purchase an ema (a hanging wooden plaque) on which to write your prayer or wish – stands are provided on which to hang these for the attention of the deities or spirits. Many different designs are available at all the different shrines and temples; they cost a few hundred yen each and sales of these and o-mikuji support the shrine financially. I think they make a lovely souvenir too. With its striking paths lined by vibrant red torii (gates), Fushimi Inari-taisha is a Kyoto landmark that often features in the tourist brochures. Although it’s hugely popular, some visitors don’t make the trip because it’s in a location with few other top-level attractions. As the head Inari shrine in Japan, Fushimi Inari-taisha is large and grand. Inari is the kami (spirit) of fertility, rice, and industry, amongst others and many come here to pray for success with their harvests and in business. A popular way to give thanks to Inari is to donate a torii to the shrine, and the trails behind the shrine are lined with many hundreds of torii of different sizes. Each one is inscribed with the name of the donator and the date the gate was given. The paths, rising up the mountainside, are known as senbon torii – thousands of gates – and there really are thousands of them. With the rising or falling sun casting golden light and striped shadows, they are quite a sight! As foxes are the messengers of Inari, there are also regal fox statues across the site. Yasui Konpira-gu Shrine is one we stumbled upon when walking from Kennin-ji to Yasaka Pagoda. The entrance is in a quiet residential street, through a beautiful stone tori gate. The key attraction here is The Stone of Breaking and Bonding, also nicknamed The Divorce Stone, and is known for its power to end bad relationships and start new, positive ones. It’s a large boulder with a hole through the bottom, and is covered all over with a coat of paper slips. Supplicants purchase a slip from the counter, write their wish upon it, glue it onto the stone and pass through the hole in the stone. One direction asks the resident deities to breaks bonds, the other to make them. Unsurprisingly, most of those in the queue during our visit were young girls; each one wriggled her way through in one direction and then back again in the other. It would be easy to walk right by this tiny temple without even noticing it but if you visit the Yasaka-no-to Pagoda, it’s worth a stop, being right next door. The temple is dedicated to Shomen Kongo, a guardian warrior, and to the three wise monkeys. Shomen Kongo’s nickname is Koshin-san, and Koshin is the faith represented here, incorporating elements from Taoism, Shintoism and Buddhism. Koshin-san is said to help those who strive to be good (and to punish those who are bad). 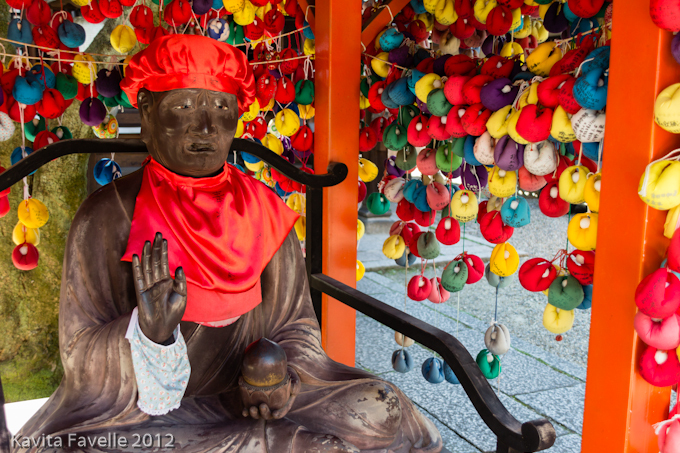 The hut containing Koshin-san’s likeness is hung with kukurizaru – coloured balls of fabric in the form of good faith monkeys, with feet and hands bound. These represent control over playfulness and desire-driven behaviour. Instead of leaving ema or o-mikuji visitors make a wish by placing one of their (bad) desires into a kukurizaru and leaving it with Koshin-san. Koshin-san takes away the desire and grants the wish. There are also wooden carvings of the “hear no evil, see no evil, speak no evil” monkeys. Japanese folklore regard monkeys as kind spirits that protect people and their homes against evil spirits. Londoner Kavita Favelle is a food and travel blogger who loves to eat well and travel often. On her blog Kavey Eats she shares recipes, restaurant reviews and stories of adventures, home and abroad. She also helps to run her mum’s Indian cookery website, Mamta’s Kitchen, which has a worldwide audience. Having studied French to degree level (a long time ago) she's far more nervous about learning Japanese ahead of her second trip to the country later this year.